Traditionally, Microsoft’s Bing Ads have played second fiddle to Google AdWords. Always the bridesmaid, never the bride. The less attractive cousin that struggles to attract PPC suitors. 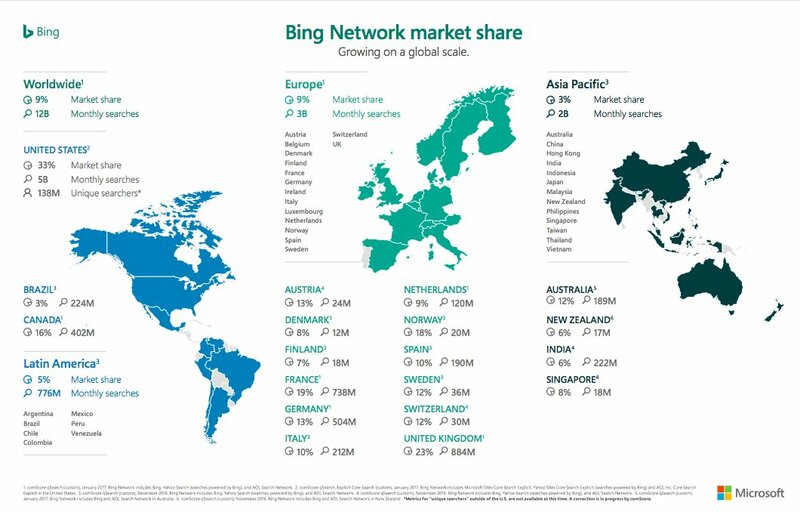 However, the Bing Network (which powers ads for Yahoo, Amazon and AOL, as well as Bing) has rapidly extended its reach in recent times, achieving 9% of the global search market. While that may not sound like an earth-shattering figure, numbers in the UK and US are certainly on the rise, with market shares at a considerable 23% and 33%, respectively. Since the introduction of Microsoft Edge and Windows 10, Bing has been set as the default search engine for numerous devices, meaning those who prefer Google have to make the switch manually. As such, Bing Ads are now served to more people than ever, accounting for its rapid growth (in 2013, Bing’s market share in the UK was just 4.9%). Voice search is quickly growing in stature, and with Bing coming as standard on leading digital assistants such as Amazon’s Alexa and Microsoft’s Cortana, this increasingly popular innovation could soon put a serious dent in Google’s market share. Are Bing Ads worth it? Almost 20% of the Bing Network audience is aged between 35 and 44 – an age group that typically has high earnings with a reasonable level of disposable income. Thus, ecommerce marketers have been testing the waters with Bing in greater numbers. Bing also lets you set gender preferences and dictate age ranges for all ads, whereas Google only allows you to specify such details for video and display ads – not those on search listings. It’s impossible to entirely block the wrong audience from seeing your ad, but you can increase bid adjustments for specific groups by up to +300%, or reduce them -90%. Thus, if you sell products aimed at niche crowds, you certainly have a better level of control on Bing. Focusing on ROI, many studies have concluded that Bing’s average cost-per-click is ⅓ cheaper than Google’s, due to fewer advertisers competing for high-performing keywords. With its wider reach, AdWords is still likely to achieve more impressions for your campaigns – worth bearing in mind because any form of advertising is essentially a numbers game. However, a fair portion of the one million AdWords marketers are likely to be your direct competitors, so the CPC will invariably be higher compared to Bing Ads. Other studies indicate that the overall cost-per-acquisition is around 63% cheaper on Bing, noting different user behaviour between the two platforms. If your products lend themselves to visual marketing, then Bing Ads have a key advantage over AdWords; the unique Image Extension tool allows photos to appear in-line with ads, enabling you to really catch the eye, giving searchers clear visibility of exactly what’s on offer. Up to six images can be displayed alongside ad copy, and embracing this feature can certainly attract more clicks. If you currently run AdWords campaigns and are considering expanding your reach via Bing Ads, there’s a relatively straightforward way to get started. Within the Bing Ads menu, you’ll find a category named ‘Import campaigns’, allowing you to ‘Import from Google AdWords’ – making a somewhat laborious task quick and easy. It’s also possible to track Bing Ads via Google Analytics, making use of one analytics platform to cover all bases. However, time should be taken to optimise bespoke Bing Ads campaigns – making the most of Image Extensions, for example – rather than solely relying on default imports. Is Bing the real thing? Every PPC marketer under the sun preaches the value of trial and error when running successful campaigns, and the world of paid search allows for much experimentation, empowering you to concurrently run several versions of the same ad to see which one performs better. This willingness to try new things should be extended to Bing Ads; the only way to find out whether it’ll actually work is to give it a go. It’s highly likely that spreading your net will pay dividends, helping you obtain maximum exposure as you fine-tune messages, utilising the unique features of each platform and crafting landing pages that convert. Ultimately, there’s less competition on Bing, but the audience is growing fast. The ad space is still cheaper than AdWords, and it’s getting more attention with each passing month. AdWords is still the market leader, and there are many benefits to having a wider reach, but to really cash-in on pay-per-click, embracing Bing Ads might do the trick.